Full-blown, big suspension trail bikes are cool, but they get uncool pretty fast when its time to ride them up the trail. With the large rolling stock found on the Camber Expert Carbon 29, however, youll be moving with maximum efficiency uphill with enough travel leftover to tear the descent. At both ends of the bike, youll find sufficient travel lengths that deliver plenty of plush suspension—all without going overboard on big hit capability. This means that you dont have to sacrifice efficiency, weight, or sheer speed to ride how you want. And with our Trail 29 Geometry and lightweight, stiff and smooth Concentric Pivot at the rear, we can guarantee it. The other trail component of the Camber is utility, and along these lines, it features our fully integrated SWAT™ Door at the down tube of the frame. Open it up, and youre able to safely and securely house your ride essentials right where you want them—on the bike. For the build, Specialized selected components like a SRAM GX Eagle one-by drivetrain with a Truvativ Descendant crankset, powerful SRAM Level TL brakes, a FOX 34 fork, and a custom-tuned FOX FLOAT rear shock. Altogether, its a bike thats can do it all, and do it all fast. > FACT 9m carbon Trail Chassis w/ Camber FSR M5 alloy rear end is mated with our Trail 29 Geometry to form a bike thats just as at home on the climbs as it is mowing over rough trail sections. Youll also find internal cable routing for clean lines and minimal maintenance and an integrated SWAT™ Door for zero-hassle storage of your trail essentials. > FOX 34 Performance Elite 29 fork features 34mm aluminium stanchions that are equal parts strong and stiff, 120mm of plush, trail-taming travel, and three-position lever adjust that lets you customize the suspension on-the-fly for any trail condition. > A SRAM GX Eagle shifting controls a wide range of gears with reliable precision. 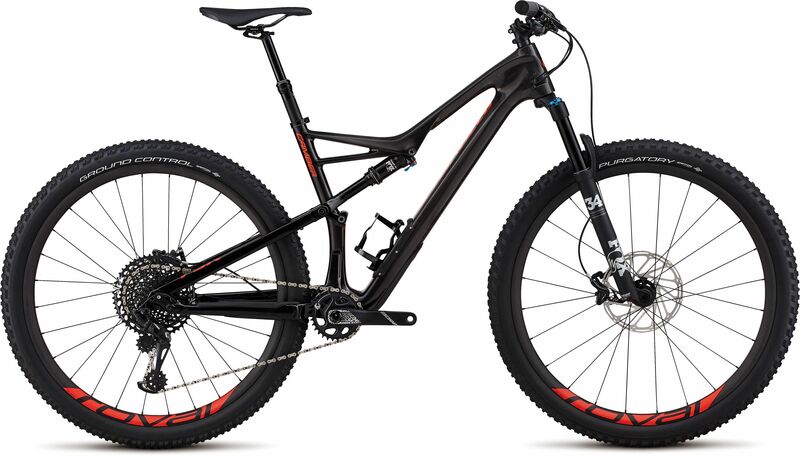 Please see below for delivery options for Specialized Camber Expert Carbon 29 Trail Mountain Bike 2018.